MC Property Maintenance offer high level access platforms and cherry pickers for hire across East Sussex, West Sussex and the surrounding areas. Our specialist fleet is available for domestic and commercial clients for both short- and long-term projects, with professional, licensed operators for hire if required. Choose from our range of high level access platforms, all less than three years old and including self-drive truck mounted, trailer mounted and narrow tracked spider lifts to accommodate the precise needs of your project. 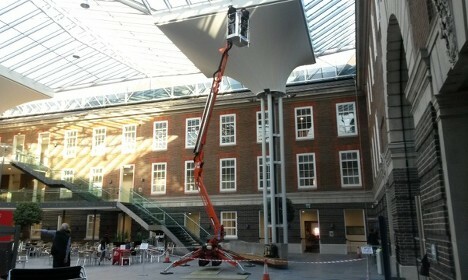 Cherry pickers offer a versatile and cost-effective alternative to scaffolding. They require no intrusive installation and can be used on the exterior and interior of any building. We have provided expert on-site assistance at factories, construction sites, shopping centres and churches, and are always happy to help our clients find the best cherry picker to hire. Can I use a cherry picker myself? We do offer self-hire options, if you wish to operate the cherry picker yourself. However, a standard driving license only permits holders to operate machinery up to 3.5 tonnes, so depending on your project requirements, you may need the assistance of one of our qualified operators. How do I choose the right cherry picker? There are a number of factors which need to be considered when choosing the best cherry picker for your project. For example, how high do you need to reach? What items do you need to bring in the bucket with you? Do you only have a standard driver’s license? Use our cherry picker guide to determine the most important features of your cherry picker, and compare your options using the table below. MC Property Maintenance offer cherry picker hire all over Sussex, from Chichester and Worthing all the way across to the Eastbourne area. Our services are available in Brighton, Crawley and East Grinstead, and we cover a number of locations in Surrey, including Guildford and Woking up to Leatherhead and Dorking. To find out more about cherry picker hire in Sussex for your next project, or if you have any questions regarding our other services, get in touch with us today. Simply call us on 01243 530076 to speak with a member of our team, or complete the form below and we will get back to you as soon as possible.